NEW DELHI, Jan 21 2010 (IPS) - Happiness for Alok and Saddam is the bare canvas tent set up in the middle of a grassy traffic island close to Delhi Gate, the entrance to the old quarter of India’s capital. “For warmth we have each other,” said the grinning homeless youth, tucked up under a pile of coarse blankets provided by a non-government organisation. 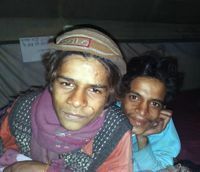 The boys, in their late teens, should soon benefit from court rulings which will ensure the tent – set up by the Aashray Adhikar Abhiyan (AAA) or Shelter Rights Campaign, to shelter up to 100 homeless people – will exist through this season’s chill and dense fog across northern India, where temperatures hovering close to zero degrees Celsius have already taken 300 lives. On Wednesday, India’s Supreme Court, acting on a petition from the People’s Union of Civil Liberties, a human rights organisation, ordered the Delhi state government to ensure that no one suffers for want of shelter. “If there are no shelters, put them in some vacant buildings. It is only for a few days till the conditions improve,’’ ordered Justice Dalveer Bhandari. “While last year there were 46 shelters during winter, which included 17 permanent shelters and 29 temporary shelters, this year the number has been reduced to 33 [17 permanent and 16 temporary] shelters. Further, of these 16 shelters, one was demolished,” the apex court said. Perhaps it was judicial anger at that one demolition, carried out by the Municipal Corporation of Delhi (MCD) on Dec. 22 last year, as part of beautification work for the Commonwealth Games being hosted by the city in October, that saved several hundred homeless people from having to sleep under the pitilessly cold sky this winter. Taking suo moto notice of newspaper reports on the demolition, or acting on its own cognizance, the Delhi High Court summoned officials to explain how the shelter, on a traffic island in the busy Karol Bagh shopping area, was demolished. “Have you thought of the suffering of people due to the demolition? You give as explanation for the demolition the grounds of beautification and the Commonwealth Games?’’ Chief Justice A.P. Shah thundered at them. Within days of the hearing the MCD put up an alternate shelter, but not before two of the 250-odd affected people died of exposure. Moved by the plight, St. Michael’s, an elite school in the neighbourhood run by the Archdiocese of Delhi, threw open its classrooms for homeless people to sleep in at night. “We are providing shelter and blankets to people who cannot avail themselves of facilities from the MCD,” confirmed a church spokesperson. Another Catholic school, St. Columba’s, has been offering similar services for eight years now. But the schools’ charity may be the closest encounter that Delhi’s elite could ever have with homeless people. It is not unusual to see climate-controlled luxury cars driven at top speed by the well-heeled whizzing past rows of sleeping human forms covered with torn blankets or newspapers on the pavements. Curiously enough, it was hope of finding work for the Commonwealth Games, the holding of which is considered prestigious for rapidly globalising India, that brought many of the homeless to New Delhi. “This is one of the contradictions of the system – while well over 1.6 billion U.S. dollars are being spent on an event, mostly on infrastructure and construction, there is nothing planned for the labourers who are actually doing the building work,’’ said Dunu Roy, well-known activist and planner. Kaur said the government had failed to issue Delhi’s homeless people below- poverty-line (BPL) cards, the key to food and other entitlements, as directed by the Supreme Court three years ago. This despite the fact that the Commissioner of Food and Civil Supplies had identified 15,000 homeless families as being eligible for the cards. “We find ourselves up against a mindset in the government that sees homeless people as a burden on the city’s resources rather than as people who provide valuable services as rag pickers, rickshaw pullers and construction labourers, so they are doomed to remain faceless, without identity and entitlements as citizens,’’ she told IPS. What that means is that the homeless are extremely marginalised and vulnerable to exploitation for their labour, to brutality at the hands of the police. Without access to medical aid or support, they often go hungry, especially if they do not find enough work or are unwell. They are also exposed to Delhi’s extreme weather and to the filth and severe pollution on the streets. “At the permanent shelters, AAA is able to provide meals and some medical care, especially for the old and ailing. But not in the tented, temporary shelters,” Kaur said. Of New Delhi’s 25 permanent night shelters, 10 are run by the MCD and 15 by AAA, which also has 38 tents set up in different part of the city. “After the court orders, the government’s main activity has been to put up banners near our tented sites to just claim the credit,” Kaur added. According to Sanjay Kumar, who also works with the AAA, the official indifference extends to women, who form about 10 percent of Delhi’s homeless people, especially after the sole shelter for women in the capital was shut down in June 2007. “You can see them huddling together in busy places like railway stations, road intersections and temples, where they are warmer and safer. Sleeping on the roadside is asking for trouble – from policemen to passing vehicles driven by reckless or drunken drivers,” he said.